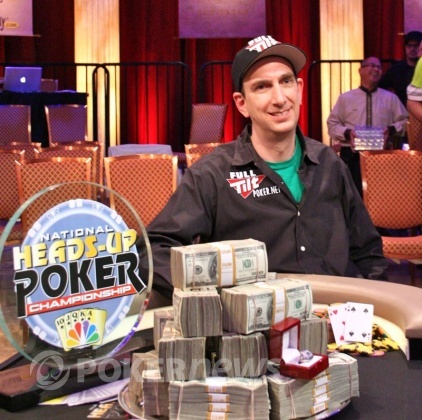 Congratulations to Erik Seidel, Champion of the 2011 NBC National Heads-Up Poker Championship! What can we say about Erik Seidel that hasn't already been said -- in the last two months? Seidel is having a monster 2011. At the PokerStars Caribbean Adventure in January, Seidel finished 3rd in a $5,000 6-max event ($46,560) and 4th in the $25,000 High Roller event ($295,960). He then shifted locations to Australia, where he banked $618,139 for a 3rd-place finish in the $100K High Rollers before taking down the $250K Super High Rollers for $2.4 million. In February Seidel returned to the U.S. to play in a few events at the LA Poker Classic. Although he didn't cash in the $10,000 World Poker Tour Main Event, he did final table a few side events. He took 5th in the $5K Heads-Up event ($14,500) and then won the $25k High Rollers event for another $144,570. Now Seidel can lift over his head the trophy of NBC National Heads-Up champion and add $750,000 to his already bloated bankroll. This prize just barely eluded Seidel last year. After five straight years of failing to get out of the first round, Seidel made it all the way to the finals. There he fell in three matches to his good friend Annie Duke. Seidel's path to the finals this year wasn't easy by any means. He had to defeat, in order, Allen Cunningham, Jennifer Harman, Phil Gordon, Vanessa Selbst and Andrew Robl. Then, in the finals, he had to deal with a very tough Chris Moneymaker, who felled several legends of the game on his own path to the finals. The year is only two months old and already Seidel has $4.3 million in cashes. Those cashes have vaulted him into 1st place on the all-time money list. Who knows how many more millions in cashes he'll add before the year ends? That wraps up our coverage of the 2011 NBC National Heads-Up Poker Championship. If you're still jonesing for a fix of poker coverage, click over to the live reporting of The Big Event at the Bicycle Casino, where a crack PokerNews live-reporting team has already been hard at work for two days. Until the next time Erik Seidel wins an event (tomorrow? ), you can find us at the bar. Chris Moneymaker had almost leveled the match. He had climbed back to within 100,000 chips of Erik Seidel. He and Seidel took a raised flop of . Moneymaker had first action and checked. When Seidel led out, Moneymaker check-raised all in. Seidel quickly called. Moneymaker let out a yelp of frustration, then tabled -- king-high. Seidel showed for trip fives. Only running cards could prevent Seidel from lifting the champion's trophy and claiming the $750,000 first prize. Maybe that might have happened to Seidel in some other year, but not in 2011. In 2011 he's running hot enough and playing great enough that the board blanked out immediately on the turn. 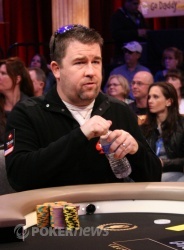 Chris Moneymaker finishes as the runner-up in the 2011 NBC National Heads-Up Poker Championship, good for $300,000. Send a few pots back to Chris Moneymaker. He has around 600,000 again but blinds just went up to 15,000 and 30,000. Erik Seidel has the chip lead against Chris Moneymaker in Match 2 of this best-of-three finals. On a board of , Chris Moneymaker made a substantial river bet. Seidel, as his been his custom throughout the match, took about thirty seconds before calling with , aces and eights. We didn't get a clear look at Moneymaker's hand but it appeared to be a bluff. Whatever it was didn't beat aces and eights. Moneymaker's in trouble now. That pot was critical. He appears to have about 300,000 in chips. Seidel has the remaining 1.3 million. We're on a quick bathroom break here in the second match. Small ball is still the approach of both players. Erik Seidel has whittled Moneymaker's lead. The approximate counts are now 900,000 for Moneymaker and 700,000 for Seidel. The two players have been trading small pots back and forth for the last 10-15 minutes. The match remains stalled with Moneymaker at about 1,000,000 in chips and Seidel at about 600,000. Blinds are currently 8000-16000. There's still plenty of play left in this one. During the break, Caesar and several of his friends arrived in the poker room. They took photos with fans but didn't make it onto the set before the cameras started rolling. About 25 minutes into the match, Caesar and a centurion strode onto the stage and took their places standing regally behind the heads-up table. They make an eye-catching frame with the championship trophy between them, but we're curious to see how production explains their mysterious appearance mid-match. Fast forward the actino to the river of a board. Chris Moneymaker had first action and led with a bet of roughly 150,000. Erik Seidel silently tossed calling chips into the pot, then knocked the table "good hand" after Moneymaker tabled for a full house. Dragging the pot has given Moneymaker what might be his first lead of the finals. Seidel is one step closer to winning the championship.